Quiet and still. A dream of glory now become a nightmare of darkness and despair. Was this man truly the Son of God as they had come to believe? What about the miracles? The healings? The calming of the storm, casting out of demons, the promises made? Twelve thrones for twelve who would sit upon them, judging the Twelve Tribes of Israel in the new Kingdom of God. Was it all a mistake? A lie? A cruel trick? Imagine you are one of the disciples gathered together after the Crucifixion. All of your joy has turned to sorrow and a deeper sorrow than you ever thought possible, just as you had never thought it possible to feel so much joy as you felt when you walked at the side of the Messiah. The one you thought was the Messiah. 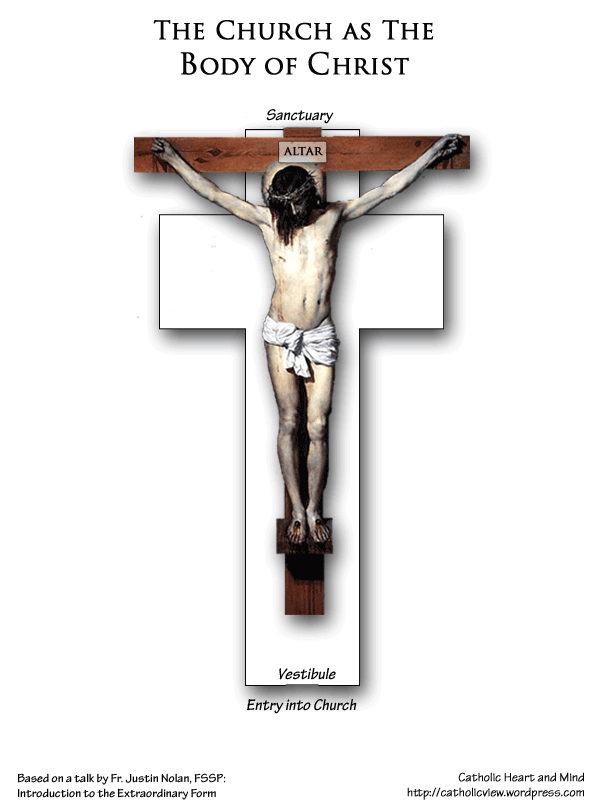 The one who you watched from a distance as he hung helpless on the cross, gasping for breath, covered in his own blood. You thought he was really the Son of God come to earth to redeem God’s chosen ones, to shake off the yoke of Roman oppression and bring back the glory lost since the reign of Solomon. What sounds would we hear as the disciples cowered together? Did psalms surge up to God from their grief-stricken throats? Did they remember what they had learned, to offer even this to the Lord? Or were they more concerned with their own safety now that they were bereft of their master’s care? Did they long to go to the Temple and hear and recite the Scriptures in the assembly? Or would the pain have been too great, hearing, as they were accustomed, the warmth of his voice as he explained to them what all these things meant? Did the three closest to the Lord now bow their heads in shame for having deserted him then when he needed them most, unable to fight the desire for sleep, letting slip through their fingers that one last hour with him who truly was their true heart’s desire? “O foolish, and slow of heart to believe in all things which the prophets have spoken. Ought not Christ to have suffered these things, and so to enter into his glory?” And beginning at Moses and all the prophets, he expounded to them in all the scriptures, the things that were concerning him. — Luke 24:25-27 (DRC). And they said one to the other: Was not our heart burning within us, whilst he spoke in this way, and opened to us the scriptures? — Luke 24:30-32 (DRC). And they were persevering in the doctrine of the apostles, and in the communication of the breaking of bread, and in prayers. — Acts 2:42 (DRC). Wait a minute. What was that we read a moment ago: and their eyes were opened, and they knew him… Where have we seen that before? Of course, it’s another echo, this time from the scene in the Garden of Eden! And the eyes of them both were opened: and when they perceived themselves to be naked, they sewed together fig leaves, and made themselves aprons. — Gen 3:7 (DRC). Satan held out the false promise that Adam and Eve could become like gods, deciding what was good and evil for themselves, if only they would listen to him instead of God and eat the fruit he offered. And their eyes were opened and they were ashamed! Christ, the true Manna Who came down from heaven, Who came into the world to undo Satan’s sin—and his victims’—broke bread and gave it to His disciples, communicated Himself to them in Holy Communion, and their eyes were opened, eyes for faith and not eyes for shame. Eyes that were made for truth and for holiness, eyes that had been closed to Holy Truth for too long, eyes that were made to, and at last could, see! It is precisely in the liturgical worship in the assembly, the participation in the Holy Sacrifice of the Mass in the Church every day but most especially on the Lord’s Day, Sunday, the day of the post-Resurrection appearances, that Christ restores our Reditus—our response to God’s Exitus, the outpouring of His love—that was destroyed by Original Sin. It is in the liturgical assembly that we as disciples learn from our Lord how to be disciples. That we commune with our Lord. That we receive His grace and the power, from Him, to know good from evil, that we learn to see as He would have us see, not as the world sees or the prince of this world. That we learn from the King of the Universe, how to unite ourselves to Him and partake of His Divine Sonship. That we learn from the Son how to unite ourselves and our sufferings to His sufferings and to pick up our crosses and follow Him. This is the way He gave us, the way He showed us, the way He meant for us to follow, to follow Him Who is the Way and the Truth and the Life so that we might have Life, Eternal Life. This is what we do as Catholics, as Christians: we obey our Lord, we listen to Him and learn from Him and receive our life, our very life, from Christ Himself at each and every Mass we attend. We are present in the Lord’s Presence. This is what we were created for. What we were born for. We were made for heaven. And uniting with Christ in the Mass is the Way we get there. Thank you for accompanying me on this first journey into Scripture and the Mass. 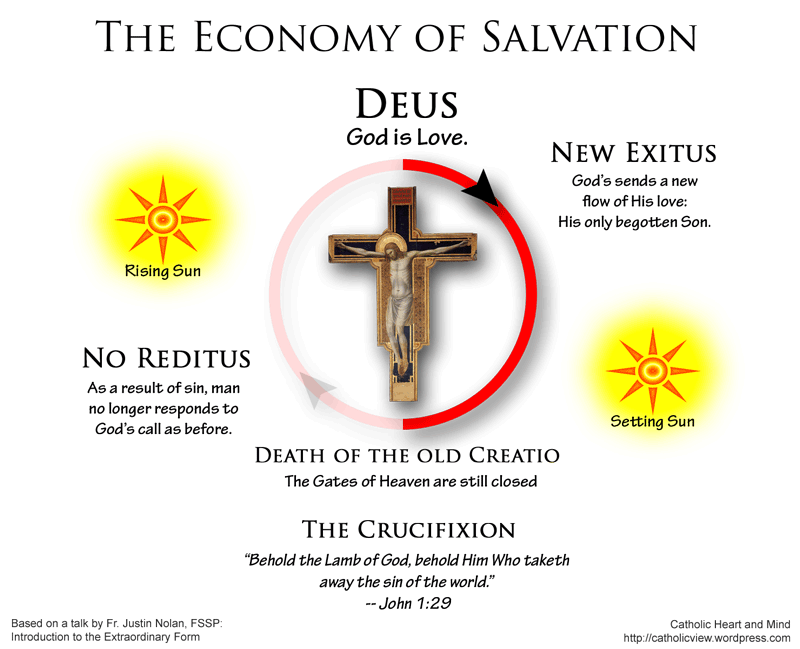 We’ve come to the end of this particular road, but, really, we have barely scratched the surface of the meaning of salvation and the sacraments. We’ve made a start, though, and I hope that you will join me again as we dive deeper into the mysteries of Christ and His Church, the steward of those mysteries. And please feel free to leave a comment using the comment box below. Until we meet again, may the peace of Christ be with you, now and always. 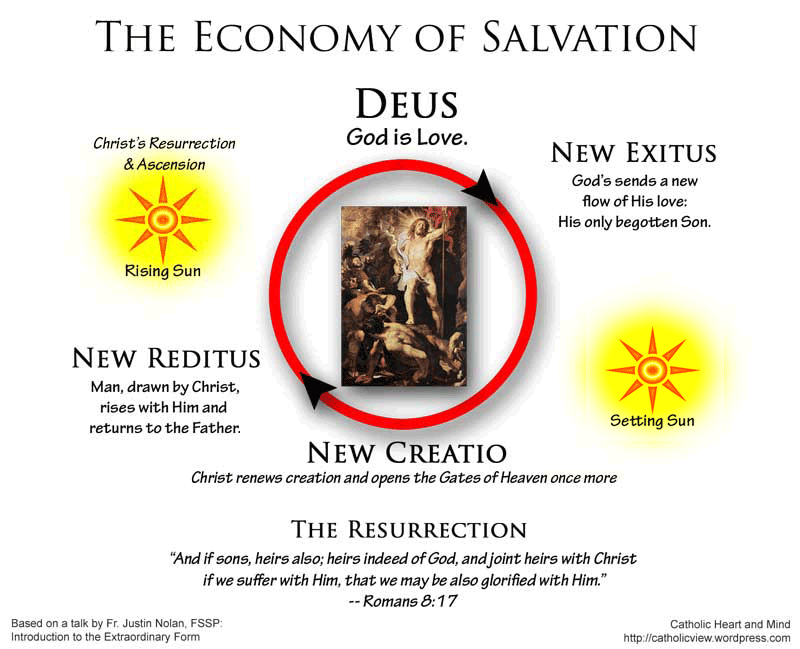 Posted in Catholic Doctrine, Economy of Salvation, Liturgy, Liturgical Prayer, Series and tagged as Adam, Ascension, Church, economy of salvation, Emmaus, Eve, Genesis, Incarnation, Jesus Christ, Liturgical Prayer, Liturgy, Mass, Original Sin, Resurrection, sanctifying grace.